Just read: Can I Really Trust the Bible? Can I Really Trust the Bible? is part of The Good Book Company’s “Questions Christians Ask” series. This title is clearly a question asked by people who aren’t Christians too but the tone of this book seems primarily aimed at people who have both faith and uncertainty, and wish for more of the former and less of the latter. Cooper asks three questions which follow Pooh’s pattern: does the Bible claim to be God’s word, does it seem to be God’s word when we look in it, and does it prove to be God’s word when we put it into practice? It’s a useful structure which takes in along the way a number of the key issues people have when considering the Bible’s trustworthiness whilst holding its own logic to build its case. At under 100 pages long, the book’s brevity (and price) makes it an attractive place to start exploring this vital topic. 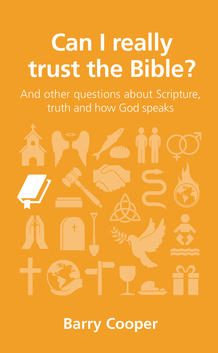 For those who want their questions answered in greater depth, and with more focus on a non-Christian’s perspective, Amy Orr-Ewing’s similarly-titled and similarly-brief (144 pages) Why Trust the Bible? is an excellent alternative. Where Cooper is strongest is when his love and enthusiasm for God’s word is on display, which it is on most of its few pages.